One of the best ways to do your bit to discourage intensive farming is to buy the best quality meat you can afford and don't waste anything. In the 1950s, a chicken was considered a treat and a good quality bird was cooked and enjoyed rarely - Britons today each eat 23 kilos of chicken a year, compared to only one kilo then. The classic British roast chicken dinner is the perfect example of how you can make good choices and be a responsible consumer. The best place to buy your chicken from is your local butcher, although if you have to go to a supermarket, make sure to buy a chicken with the red tractor logo. This is the logo for Assured Chicken Production, which guarantees standards of animal health and welfare and food safety. You can also buy 'premium' brands in supermarkets now, with the names of the farms where the chickens were reared. Once you have bought your chicken, you need to cook it. For a perfect roast chicken, you will need to cook it in a medium hot oven for 20 minutes per pound and 20 minutes extra. There are plenty of tips for getting even more flavour into the bird, but as you are buying a good quality chicken you may chose to roast it with just a little olive oil and salt and pepper. Ideas for adding to the flavour would be using a rub over the skin (try chilli and lemon, Cajun spices or garlic and parsley) or stuffing under the skin with herb butter - tarragon works well. You can also put a cut lemon in the cavity, or a few cloves of garlic. You can also slash the legs and rub your flavouring in there, too, which also has the benefit of making sure the legs are totally cooked through without the breast meat getting dry. When you have enjoyed your roast chicken, there are plenty of ways to make the most of leftovers and the carcass - you can easily get three evening meals for two people out of a medium chicken, with some meat for sandwiches, too. Pick over the bird and remove most of the meat that you can see - make sure you check underneath, too, especially for the 'coral', a rich little pebble of chicken either side of the back ribcage. You can use this meat for a stir fry with egg noodles and plenty of vegetables, a Thai curry, with coconut milk and plenty of green beans, or to make a classic bubble and squeak if you have potatoes and vegetables left from you roast dinner. 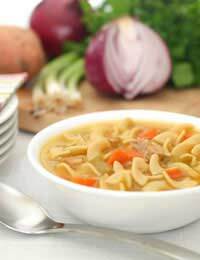 The next day you can make a delicious soup using the carcass - make sure you keep it refrigerated. Using a large stock pot put your carcass with plenty of fresh, cold water, a couple of roughly chopped carrots, an onion, a few peppercorns and a bay leaf. Allow this to simmer for as long as you can - ideally a few hours - stir and scoop off any fat or scum every once in a while. Drain the soup into a clean pan and add whatever vegetables you fancy - you can also add potatoes or noodles. If you want to make an oriental soup, add sliced ginger, garlic and spring onions instead of the bay leaf when you simmer the stock.